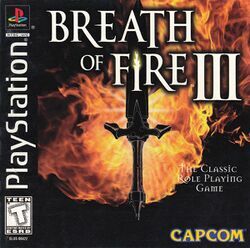 Breath of Fire III (Japanese: ブレスオブファイアIII, "Buresu obu Faia Surī"?) is an RPG developed and published by Capcom for the PlayStation game console. Originally released in Japan in 1997, the game was later released for North America and the PAL region in 1998. It is the third video game in the Breath of Fire series, and the first to feature three-dimensional environments and effects, as well as several new gameplay elements including an expanded combat system, the ability to learn enemy skills, and environment interaction. In 2005, Breath of Fire III was ported to the PlayStation Portable handheld system in Japan, with an English version released exclusively in Europe in 2006. Set in a fantasy world, the story concerns Ryu, a young boy with the mysterious ability to transform into powerful dragons who must discover the truth behind his origins, as well as locate his lost friends and surrogate family, Rei and Teepo. The game's plot is presented in two parts: half concerning Ryu as a child, and the other as an adult. He is accompanied by a number of supporting characters who aid him on a journey that leads them across the world and eventually confront a mad goddess. Though modestly successful, the game is described as a thoroughly traditional yet classic role-playing game with a unique Jazz-inspired soundtrack. This page was last edited on 5 June 2012, at 20:23.